In 1871, a kilometre-long train tunnel was constructed under the high ground of this historic district on the southern side of the city. 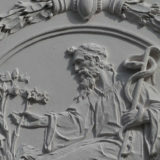 Moritz Gröbe, the railway magnate whose company was responsible for digging it, had the excavated debris hauled up the hill to build the foundations of the villa. The main house, which was built on the site of the earlier farmstead Upper Landhaus, was designed by Antonín Barvitius and Josef Schulz. The substantial grounds boasted a gazebo, a grotto with a statue of Neptune, and a bowling alley, all of them now lovingly reconstructed. In 1905 the house was sold by Gröbe’s heirs to the commune of Vinohrady, after which it served variously as a school and, during the communist era, as the Palace of Young Pioneers. 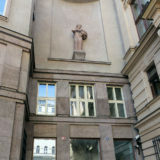 Today, restored to its original state, it is the headquarters of the Central and Eastern European Legal Law Institute. 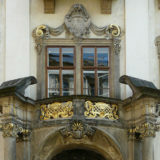 The splendid winged lion (not a gryphon, incidentally, which would have an eagle’s beak) is one of the many traditional emblems adorning the frieze of the Gröbe Villa in Vinohrady, designed by architects Antonín Barvitius and Josef Schulz.